"jump, Damn It, Jump! ": Memoir of a Downed B-17 Pilot in World War II by Edward F. Logan Jr.
We’d love your help. Let us know what’s wrong with this preview of "jump, Damn It, Jump!" by Edward F. Logan Jr.. Preview — "jump, Damn It, Jump!" 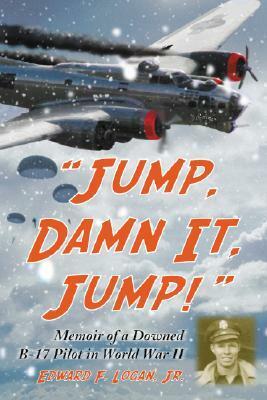 by Edward F. Logan Jr.
To ask other readers questions about "jump, Damn It, Jump! ", please sign up. Be the first to ask a question about "jump, Damn It, Jump!" My personal connection to this subject matter arose from my great-uncle's experiences as a flight engineer/top turret gunner in the 8th Air Force, and his brief memoir relating his story. Since reading his account of enduring the hardships of being held as a POW by the Germans, I have immersed myself in the history of the strategic air campaign over Europe during WWII, reading every book about the subject that comes my way. This book provides a new perspective that I haven't encountered yet. As i My personal connection to this subject matter arose from my great-uncle's experiences as a flight engineer/top turret gunner in the 8th Air Force, and his brief memoir relating his story. Since reading his account of enduring the hardships of being held as a POW by the Germans, I have immersed myself in the history of the strategic air campaign over Europe during WWII, reading every book about the subject that comes my way. This book provides a new perspective that I haven't encountered yet. As is typical of these memoirs, the author begins with his induction into the army, and the training that qualified him to be a bomber pilot. He summarizes his combat career, but the focus of this book is his fateful 34th mission, where his aircraft was severely damaged and he and his crew were stranded behind enemy lines. Flying with the 15th Air Force from Italy, the author's plane is struck by antiaircraft fire over the target in Austria in March of 1945. The author nurses the plane south, over occupied Yugoslavia, hoping to reach areas controlled by Partisans friendly to the allies. In this he succeeds, and he and his crew are rescued by the Partisans, who go to great lengths to protect them and return them to Italy to continue the fight. I'm bias because he's my uncle and a great man but this is also a really good book and story. About Edward F. Logan Jr.